Buying older prints at auctions and in antique shops can be an affordable way to decorate bare walls in a home. But don’t forget that some of these prints can be quite valuable, turning a simple decorative purchase into a treasured find. If you're interested in making an investment in a decorative print, you'll want to learn some of the big names in the business. These include the familiar pieces by Maxfield Parrish and Bessie Pease Gutmann, among others. Maxfield Parrish produced nearly 900 works during his 65-year artistic career, according to the Collector's Value Guide to Early 20th Century American Prints. More than 20 million art prints, calendars, book illustrations, greeting cards, and other printed pieces, including numerous advertising campaigns, have brought this artist's work into American homes. The original prints from the early 1900s featuring Parrish's work can be very pricey acquisitions for today's collector. Best known for incorporating an almost dreamlike quality to his work along with many beautifully posed characters, the works of this artist have been timeless favorites spanning decades. Most old Parrish prints sell for well over $150 now, even unframed, and the most popular originals produced in the early 1900s can skyrocket into the thousands depending on the subject matter. 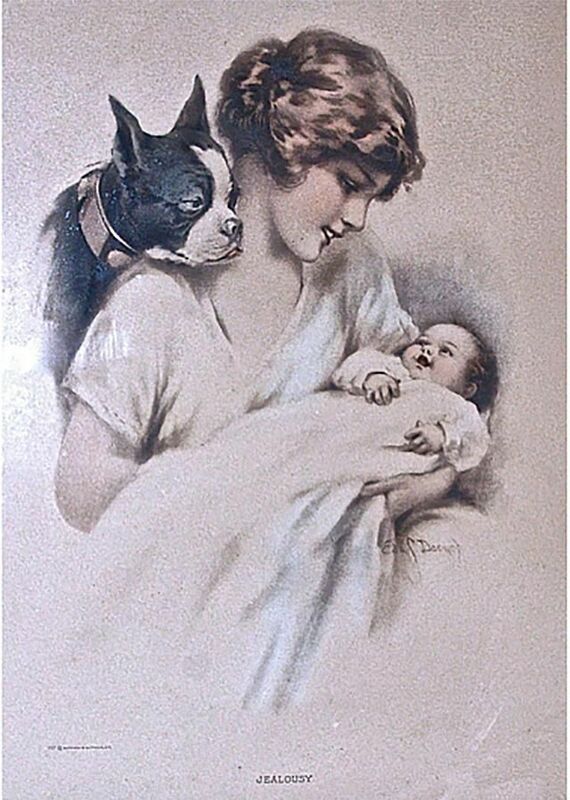 Bessie Pease Gutmann produced outstanding paintings of infants, children, new mothers and couples in love, which were widely distributed as color prints. From bright-eyed babies to angelic faced toddlers with perky puppies, Gutmann's work definitely tugs the heartstrings and can only be defined as adorable. The machine-produced prints of Gutmann's artistic endeavors between 1905-1950 receive the most attention from collectors. You can expect to pay several hundred dollars or more to acquire one of these original prints from a knowledgeable dealer. Some other vintage notables to watch for are R. Atkinson Fox, Wallace Nutting, David Davidson, Fred Thompson and Charles Sawyer among many others. Any of these names will prove to be valuable acquisitions for your collection should you run across them at bargain prices. Watch out for troublesome that can lower values, however. If you’d rather not invest in an old piece, a reproduction frames up just as nicely. In fact, you can find reproduction prints at garage sales and thrift stores for a lot less than an original print with a little persistence. There are many, many newer reproductions of popular American prints on the market today. Prints by both Parrish and Gutmann are widely available through new print dealers starting around $25 each, along with the other notables mentioned in the list above. One thing to consider when purchasing a newer print, however, is the cost of framing. Sometimes you can buy an old print in an antique frame, which will retain its value better than a new one, for not much more than the cost of professional framing. If you want a print to last, using acid-free mats and backings will be important in the long run so be sure weigh your options before cutting corners. Colorful cottage prints have the soft look of a watercolor and blend in with many decorating themes from shabbily chic styles to English country. These popular prints were produced during the first half of the 20th century and were prolific in American homes. Cottage prints have an ethereal look, like a scene from a happy fairy tale. Perhaps that's why they were so popular during the Depression years – they easily transport their admirers to a pleasant place and time. The most appealing aspect of collecting cottage prints, however, may be their inexpensive price tag when compared to the big names in 20th-century American art prints. You can find these attractive accent pieces in a modest frame for about $30-75 at antique stores and flea markets but buy now if you like them. Prices are likely to rise as these vintage pieces get harder and harder to find. If you’d rather stick to the older prints and buying big names frightens you a little given all the reproductions on the market, don't worry. The old stand-by adage of buying what you like holds true here, too. If you’re not sure whether or not a print is old, just remember not to pay too much for it and you’ll do fine. And remember, there are lots of gorgeous prints available that weren't created by notable artists like some of the cottage prints mentioned earlier. These were created using the same lithograph and early offset color printing methods that provide the distinctive vintage look collectors seek while selling for a fraction of the big name prices. Even yard-long prints, which actually measure about a yard long and 11 inches or so wide, remain popular with collectors today. Whether it's a yard of chrysanthemums or a yard of kittens, these lovely prints add a nice splash of charm to a vintage-inspired room.